It can be hard to keep kids out of the water when they know it’s not a bath they’re wading into. Pools, lakes, and the beach are among a child’s favorite places to play. Even something as simple as a lawn and a sprinkler system can spark joy during warm weather. Suit up this season with one of the ten best suits on the markets for young girls. We’ve combed through the options to bring you styles that are already a hit among hundreds of other families, so we know you’ll love them too! With summertime approaching it's important to make sure that children have the best swimsuits that will protect them while they are playing in the water on those hot days. We came up with a list of the best swimsuits that the market has to offer. We also converted this guide over to our new layout. During the summer months, some kids live in their swimsuits. To ensure you buy one that will last the summer, check out our recently updated list that includes a number of new products on the market. Additionally, all product information--fabric, construction, size ranges, cost and availability--have been reviewed and updated when necessary. The blend of spandex and nylon also makes this suit easy to put on as it stretches and then will form tightly to your daughter’s body. The suit’s material is also SPF 50, which adds more protection from the sun for your child. Girls between the ages of 4 and 16 can enjoy wearing this suit. The straps tie around your child’s neck and can be adjusted as your child grows. Composed of nylon and spandex this suit can survive countless water adventures without the colors fading. This one piece is available in red, black or pink with each one being covered with white polka dots. The retro design of this suit allows your daughter to still show off her style while remaining modest. The material is SPF 50, which provides more protection for your child’s skin. What little one hasn’t dreamed of being a mermaid? This Garlagy set allows their fondest wishes to come true! It features a tankini top, matching bottoms, and the fabric for a mermaid tail. The company also sells a monofin that helps to fill out the tail so that it functions as a proper fin underwater. The mermaid tail features zippers or buttons on the side so it’s easy to fasten into. There are nine different color schemes to choose from, all of which are vibrant and fantastical to fit the mermaid aesthetic. The monofin and tail can be a little more challenging to swim with but will help strong swimmers continue to build endurance and muscle! This gorgeous, creative mermaid swimsuit will have children’s imaginations bursting at the seams. 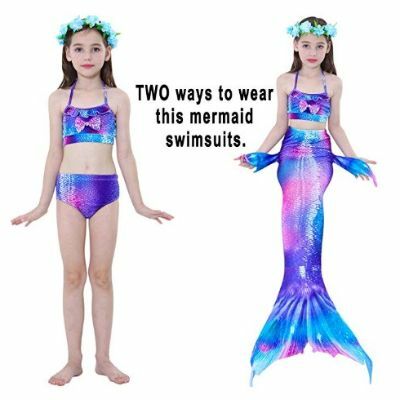 Kids will love swimming like a real mermaid with a tail and all! The monofin and tail can be a little more challenging to swim with but will help strong swimmers continue to build endurance and muscle! Little ones who are still learning can wear the tail outside of the pool in the meantime and put it on in the water when you feel they’re ready. It’s imaginative and special. 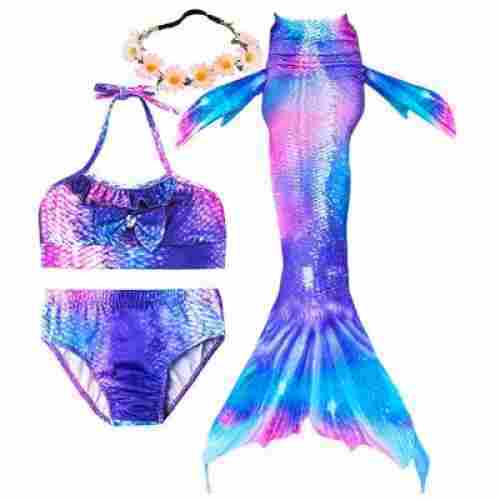 Plus, it can be worn as a normal swimsuit or as the full mermaid regalia! Both styles look cute. What does a little sailor do, oh what does a little sailor do? Lounges by the water, of course! This darling Kanu Surfgirls Layla One-Piece is made from a high-quality nylon tricot. It’s machine washable, with an 82 percent nylon and 18 percent spandex make-up. 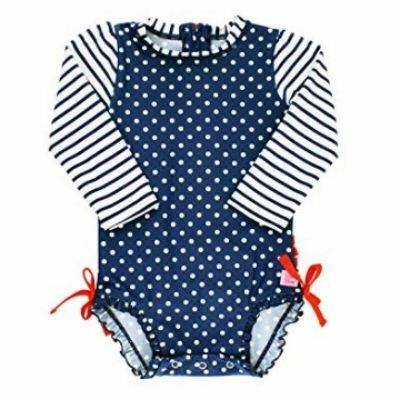 The entire swimsuit is lined and features adorable nautical stripes. If you plan on taking the baby out during a hot summer, this swimsuit will keep them nice and cool. The fabric is soft so as to eliminate any skin irritation for sensitive babies, and the print is vibrant and won’t fade quickly. Beach bums and little landlubbers alike will look and feel terrific in this awesome one-piece. The bathing suit is soft and proportioned well. You won’t get wedgies and sliding straps with this cut. The colorful designs and high-quality of the fabric means children will be extra comfortable and excited to don their swimsuits and spend some time in the great outdoors. It’s available in infant sizes up through a 14 (and big girl sizes as well in case sisters want to match), is lightweight, and less likely to absorb water, meaning that it dries much faster than other brands. Something about those stripes just feels like the sea is calling. It’s a cute style with a modest cut that is comfortable and high-quality. The fact that it’s machine washable and still won’t fade is an added bonus! Your child is bound to fall in love with these adorable one-pieces. With ten different styles to choose from, she can sport a shiny rainbow pineapple, hang around in a heart with a colorful Hawaiian flower, or blow kisses with a darling little kitten spread across her tummy. The material is a mix of 82% polyester and 18% spandex, making it durable and flexible. It’s also super soft so fussy children won’t put up a fight when getting dressed. It’s fully lined and modest, with a UPF 50+ sun protection rating. BELLOO makes these suits in five total sizes suitable for girls between the ages of four and fourteen. Swimming is a great exercise for kids. It builds cardiovascular endurance as well as strengthening muscles throughout the entire body. It’s also low impact! These designs are just too stinkin’ cute to pass up. They’re all pretty bright and colorful so kids will love them and the modesty lining and SPF protection mean parents love them too. This cute girls swimsuit by LOSORN ZPY comes with two pieces. A beautiful top that covers the full torso and has sleeves that are a half-length. In addition to a modest set of bottoms as they are shorts. 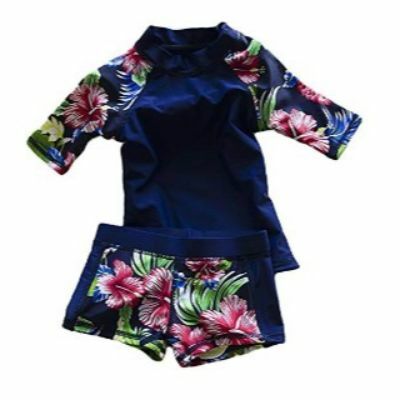 This Baby Toddler Girl Two Piece Swimsuit set has a design of bright pink with floral accents. Not only is this baby toddler girl swimsuit by LOSORN ZPY fashionable, but it is also highly protective as well. With UPF 50+, this swimsuit provides amazing protection for your kid’s skin when they are playing out in the sun. On account of the modest design of this girls swimsuit, your kid can be comfortable while they wear it as they play. With the swimsuits' vibrant, floral design your kid will be immediately captivated. This cheerful design will look great in any environment including, the beach, local pool, hiking or just for backyard play. Moreover, your kid has the option to choose a dark blue design with floral accents instead. 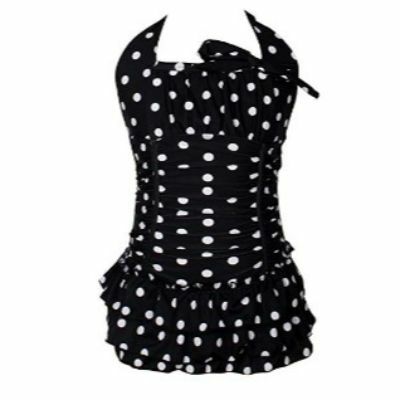 For the fact that this swimsuit for girls is integrated with UPF 50+, you can rest knowing that your young girl will be protected from harmful sun rays. 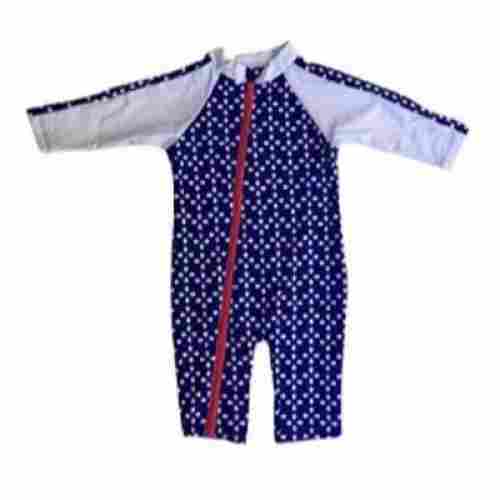 This is a great suit for kids who are going to be in moderate to intense sun for an extended period of time. It offers a little more coverage than most styles and still is comfy and cute. 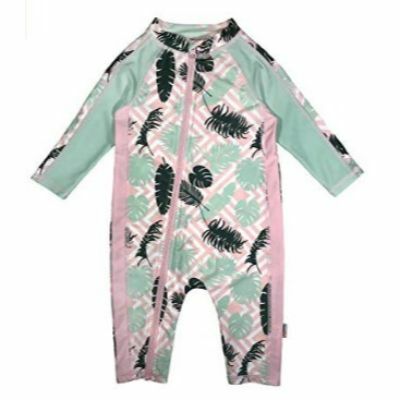 This sunsuit romper with UF UPF 50 + is great for anytime your little one may need UV protection. The legs and arms of this swimsuit by Swimzip both provide full-length coverage. Even better, it has a full-length pink zipper on the front that blends in perfectly with the sassy design. With integrated UPF 50+, this baby girl and toddler swimsuit blocks up to 98 percent UVA and B sun rays. 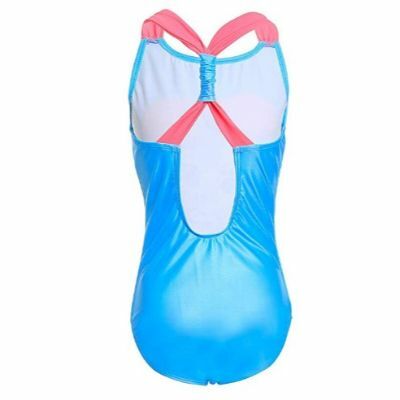 Paired with the full body coverage of this swimsuit, your little girl will be safe as she wears this suit. For the fact that it has a long zipper, this Swimzip suit promotes independence as it is easy for little ones to put on and take off by themselves. This suit is pink with a light blue polka dot pattern and ruffles on the arm and leg openings. Cleaning this Swimzip swimsuit for baby girls and toddlers is a breeze as it is machine washable. In addition to that, this zipper makes diaper changes easier than ever. 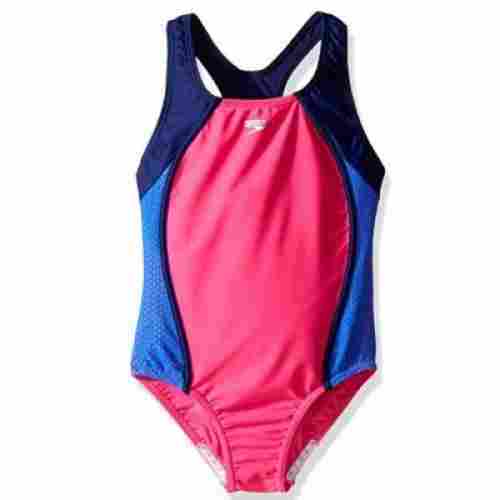 The swim material of this suit for girls is very lightweight and dries quickly to help in your kid’s overall comfort along with the tagless neck. This lovely suit feels and looks great, and the colorful ruffle design is sure to stimulate visual and tactile sensory stimulation. For the fact that this is a one-piece suit, your kid will have no problem keeping up with it when they are not wearing it. Rufflebutts knows how to make a design that’s cute and high-quality. This long-sleeve one-piece is guaranteed to help protect your child from harmful UV rays with a built-in UPF of 50+. It should be hand-washed in cold water for best results, then dried flat, to maintain the vibrancy and reduce fading. If you aren’t satisfied with your purchase for any reason, contact Rufflebutts’ customer support and they promise to make it right. It provides full coverage and comfort, and is stretchy, with 80 percent nylon and 20 percent spandex, so it can grow with your child. The signature ruffles adorn the bottom, and a darling floral, polka dot, striped, or paisley design will put a spring in their step. Snaps and zippers along the bottom are quick, efficient, and nickel-free. A zipper on the back makes it easy to dress and undress squirmy little ones. This swimsuit is comfy and will keep children from getting chilly in that brusque marine layer. The long sleeves also help provide more coverage from the sun, and the fabric features a built-in UPF rating of 50+. Kids can enjoy hours of play time at the beach, by the lake, or in the pool with mom and dad, and still be safe from harmful UV rays. Just don’t forget the sunscreen! Constructed with wide shoulder straps that will not pinch your child’s shoulders. 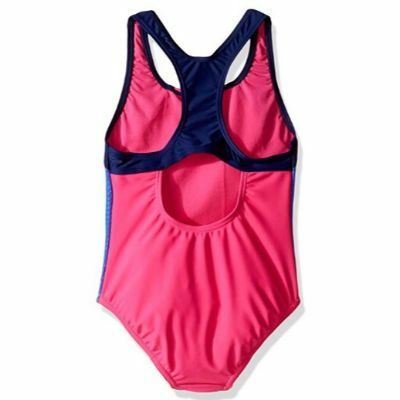 The Speedo girls one-piece swimsuit is great for your daughter’s swim meets or days at the beach. Composed of 80 percent nylon and 20 percent creora this fabric is durable and chlorine resistant so you won’t have to worry about the colors fading. 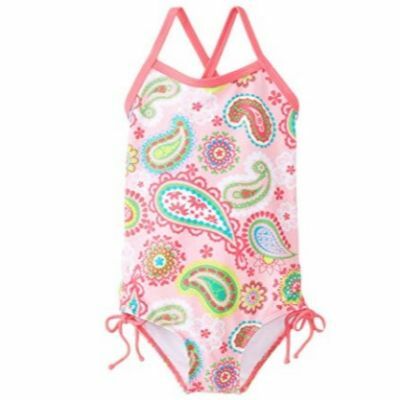 The fabric also makes the swimsuit easy to put on as it stretches to your child’s body. The wide shoulder straps provide a comfortable fit as they do not pinch or dig into your child’s shoulders. This one-piece swimsuit is available in six different color schemes, so your child can pick the one that best fits their style. The leg openings are designed with silicone grippers that will prevent your child’s suit from riding up. The sides are made with a mesh fabric that is breathable and dries quickly. 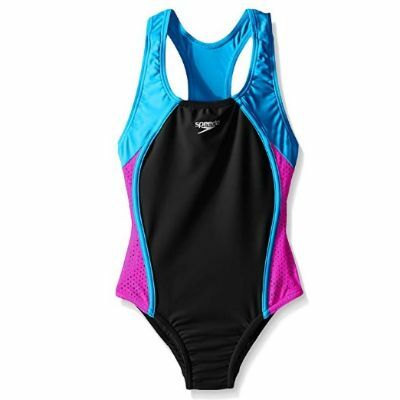 The features and the overall athletic look of this swimsuit make it great for girls who are involved in aquatic sports. While this suit is great for a day at the beach or pool, the silicone grippers make this suit perfect for girls who are involved in water sports. Whether they’re diving in the pool at the sound of a buzzer or they’re jumping up onto their surfboard, they won’t have to worry about their suit riding up. 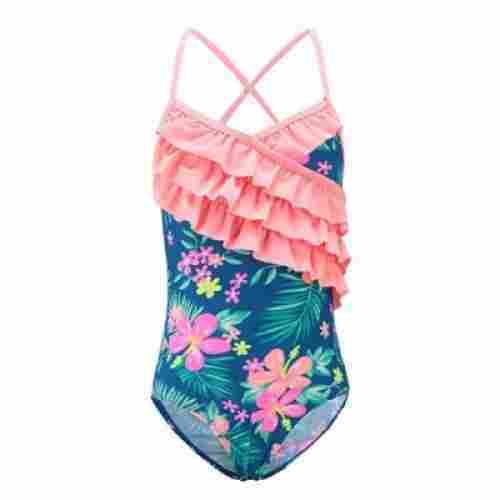 This girl one piece Hawaiian ruffle swimsuit by HowJoJo is beautiful. It has a gorgeous floral pattern that stands out on a navy blue background and bold pink ruffles across the front. 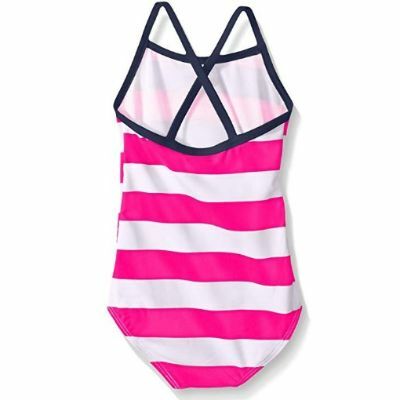 The pink straps have a halter crisscrosses halter design, making this swimsuit a very stylish option for young girls. This swimsuit is made of 80 percent polyamide and 20 percent elastane. Your kid will have all day sun protection as the high tech material has SPF 50+. This HowJoJo swimsuit for girls is specifically designed for functional use as the elastic spandex can stretch as your kid grows. Additionally, similar to many of our swimsuits, this suit aids in both visual and tactile sensory stimulation due to the bold colors and soft ruffles. The fabric is soft enough for your kid to move around in comfortably, yet durable enough to last for years. The colors in this suit are very vibrant making it easy for you to keep an eye on your child as they run along the shores of the beach or play with other kids at the local pool. Made of 82 percent polyester and 18 percent spandex, this swimsuit is great for resort swimming pools and fun on the beach. 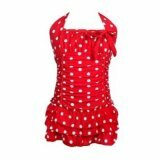 This one piece swimsuit for girls has straps to easily tie up into a halter design and a beautiful bow on the front. With the matching headband that comes with this Jastore Baby Girls One Piece Swimsuit, your kid will feel stylish and sophisticated. The attached ruffles skirt gives a ballerina like an appearance which will surely stimulate imaginative play as your little girl pretends that she is a graceful ballerina. Both the headband and swimsuit are super soft in contrast to itchy and scratchy so that your young girl will have a comfortable experience. Due to the custom halter tie, you can adjust the straps in order for this Jastore swimsuit to fit your young water princess perfectly. Several of the swimsuits on our list have dual functionality. The mermaid swimsuits can be used with or without the mermaid tail. Our mermaid tail swimsuits can also be used for birthday celebrations, costume parties as well as imaginative play and cosplay. This is great so that kids can expand their imaginations and creative thinking skills. Neurological development has a significant impact on kids, specifically younger kids as it affects how they will act and behave as they grow older. All of the swimsuits on our list of best girls swimsuit are modest in design. Many of the swimsuits in our list have sleeves, shorts, pant legs, a skirt or mermaid tail to provide proper coverage. The swimsuits above don’t reveal too much skin or private areas. When your child is at the beach or local pool, you don’t want her feeling uncomfortable for the fact her swimsuit reveals too much of her skin. As a parent, you can rest assured in many of the swimsuits above because they provide adequate coverage. When getting swimsuits for kids, especially girls, parents often have a hard time finding suits that are modest, in addition to comfortable. Modesty is a virtue that many parents want to instill in their children at a young age. Our swimsuit selection meets several modesty standards. n addition to being modest, all of the swimsuits on our list above are made of soft materials. Your kid will not feel itchy or scratchy as they wear our recommended swimsuits. 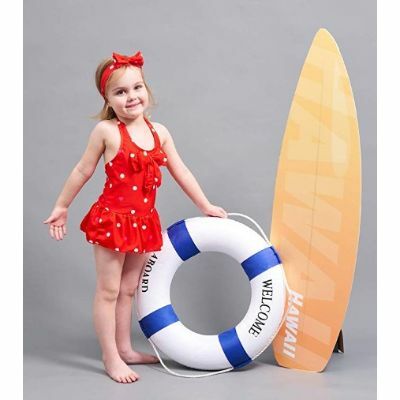 It is important for kids to be able to enjoy themselves while they are at the beach or local pool and with our best girls' swimsuits, your kid will be able to. The swimsuits above have four-way stretch so that your kid will not be limited in their movements, allowing for maximum flexibility. Girls who are young in age have a tendency to prefer swimsuits that are vibrant in color and have a soft stretchy feel so that they may swim and play in the water comfortably. This is wonderful, as parents will enjoy swimsuits that are made from non-shrinkable materials. Additionally, due to the stretchability and quality of several of our best girls' swimsuits, your little girl may be able to wear her swimsuit for more than one summer. There is nothing that is more frustrating than having to buy your kid numerous swimsuits during warm seasons because each of them has deteriorated after one or two uses. With our recommendations listed above, you certainly would not have that problem. Choosing a swimsuit that is composed of high-quality fabric is important so that it will be able to withstand high chlorine levels and saltwater concentrations. As a spectacular bonus, the majority of modern swimsuits have built-in sun protection. Meaning, that you will not have to lather your kid’s entire body with sunscreen or sunblock. With a swimsuit that has built-in protection from the sun, your kid will have more time to enjoy themselves as they wear their new girls' swimsuit. Even better, as a parent, you will be able to relax as you will not have to chase your child down to reapply sunscreen every hour, which could become quite tiresome. Moreover, many of our swimsuits can be used in a variety of environments such as in wooded areas where your family hikes. It is amazing that something as simple as an awesome swimsuit can greatly aid in ensuring that everyone has a fun time. Flexibility is essential when in any body of water. All of the swimsuits above allow for optimal mobility whether your child is in the water or on land. Although having flexibility on land is important, have flexibility while in water is even more significant inasmuch that being in water is not our natural habitat as humans. It is fantastic that all of our girls' swimsuits allow kids to move naturally in water as they would on land. Flexibility is not only a practical factor that makes swimsuits comfortable but safe as well. If a swimsuit hindered your kid from natural movements in the water, it could pose a potential threat. Safety is important when swimming or doing activities around any body of water. With our best girls' swimsuits, your kid will be able to move freely and comfortably. q: What type of sunscreen should I use for my kid? When it comes to choosing a sunscreen for your kid you want to ensure that it does not contain harsh chemicals or fragrances. This is important so that your child will not have an allergic reaction. Sunscreens that are made specifically for kids usually don’t contain harmful chemicals like avobenzone. For that fact, the sunscreen will be less irritating on sensitive skins such as kids', while doing an adequate job of protecting them from harmful sun rays. When using a new type of sunscreen be sure to perform a skin patch test to make sure it is suitable for your kid’s skin. q: What’s the difference between UPF and SPF? UPF is short for Ultraviolet Protection Factor. SPF is short for Sun Protection Factor. UPF is usually a safer option as clothing integrated with UPF absorbs and reflect harmful rays. In contrast, SPF creams absorb sun rays and need to be reapplied every hour. Additionally, chemicals from SPF creams could seep into your body. q: What is a Monofin used for? While swimming with a mermaid tail, if a Monofin is inserted, kids can properly swim. The Monofin also helps the mermaid tail to keep its shape for a more realistic look. 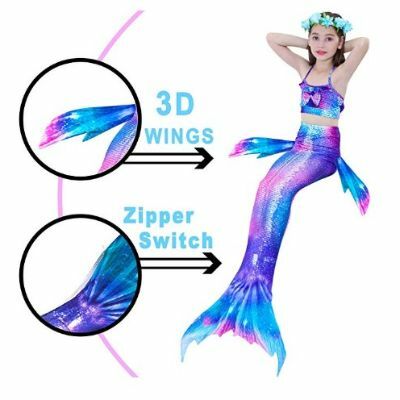 Without a Monofin, kids will have a tough time swimming with the mermaid tail on and the tail looks very floppy as the Monofin provides structure. q: How do I prevent my child from chafing due to her swimsuit? Chafing is one of the most annoying non-life-threatening issues. To prevent chafing, it is important that you make sure your young girl isn't dehydrated. For the fact that the more hydrated your kid is, the more likely she is to produce sweat. Sweat actually acts as a protective measure towards chafing. However, the longer your kid sits in sweat and other types of dirt or debris, the more friction that will build up and result in irritation. To prevent this, always keep your kid’s swimsuit cleaned and do not allow her to sit in her swimsuit for too long after she swims. q: Chafing is one of the most annoying non-life-threatening issues. To prevent chafing, it is important that you make sure your young girl isn't dehydrated. For the fact that the more hydrated your kid is, the more likely she is to produce sweat. Sweat actually acts as a protective measure towards chafing. However, the longer your kid sits in sweat and other types of dirt or debris, the more friction that will build up and result in irritation. To prevent this, always keep your kid’s swimsuit cleaned and do not allow her to sit in her swimsuit for too long after she swims. 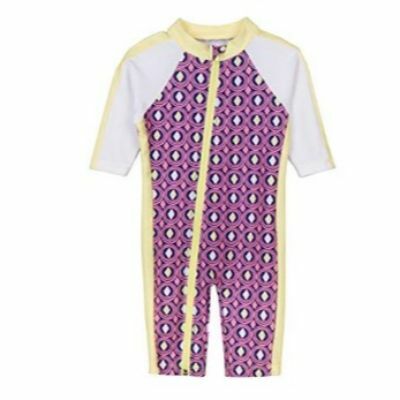 Yes, the SwimZip Baby Girl Long Sleeve Sunsuit Romper with UF UPF 50+ swimsuit is machine washable. It is recommended that you wash it on the delicate cycle due to the light weight of the fabric. It dries very quickly, so there is no need to toss it into the dryer, as the heat from the dryer could cause it to deteriorate. It is very important to always follow the manufacturer's guidelines for washing and drying a swimsuit. q: What type of swimsuit clothing material is safest in the sun? Fabrics made of nylon, wool, and cotton can naturally absorb some UV radiation. Many of these fabrics have threads that are made from elastic to pull the fibers together, tightly. This reduces and tiny holes in the clothing that may allow UV light to touch the skin. Polyester and Lycra are much more protective than cotton and wool as they absorb more UV rays. Commonly, fabrics that are light in weight do a better job of protecting skin than heavier fabrics.